My first introduction to Jonathan Lopez was at the dinner before the 2016 Operation Enduring Warrior takeover of the Spartan Ft. Bragg Sprint. I had spoken to OEW VP of communications, Kelly Farmer prior to the event and asked her to pair me with one of the many incredible adaptive athletes that would be there, so I could follow their story. She did not hesitate when she suggested Jonathan. About twenty seconds after meeting him and his gorgeous family, I knew why. We left the starting corral as acquaintances and crossed the finish line as friends. Much like most people that meet Jonathan, you cannot spend much time with him without coming to love him a bit. While he does not have much in the way of actual memory of the accident itself, he was told that he had been hit by a drunk driver while on his motorcycle. He has a vague memory of laying on the pavement, a helicopter, doctors speaking in German desperately working on him and the plane ride leading to his arrival at Walter Reed Army Medical Center in Washington DC. He was told he had suffered multiple injuries, including the loss and subsequent amputation of his left arm. He was subjected to many surgeries the first couple of months to replace his tibia and femur with titanium rods and multiple bone grafts. The loss of his arm was overshadowed by the overwhelming concern of never being able to walk again. Jonathan tried with everything he had to stay in service, but faced separation from the military. It was an incredibly difficult time, as he had never as much as imagined life outside of his direct plans. He enrolled in college, but dropped out, feeling out of place, and out of sorts, dealing with unflagging pain, and dependency on the prescription drugs that were not working. The country was at war, his fellow soldiers were dying, and he felt helpless – like someone had “stolen his destiny”. He began struggling with a deepening depression that that in the end, landed him in the psychiatric unit at the VA after an attempt at suicide. It was time to get his life back on track, and he knew he was going to have to regain control if he was going to survive. 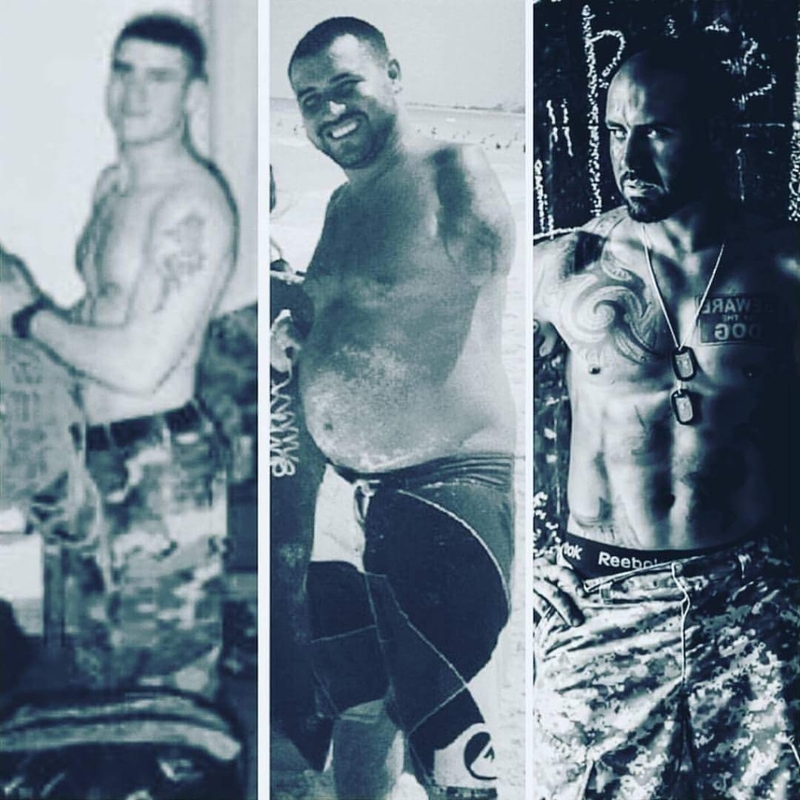 He started with getting his body back in shape. He started exercising regularly and found a natural antidepressant in his workouts. A friend asked if he would like to join his team in doing a BattleFrog race, and game for anything, Jonathan agreed to give it a try. Being on the course awoken something in him. 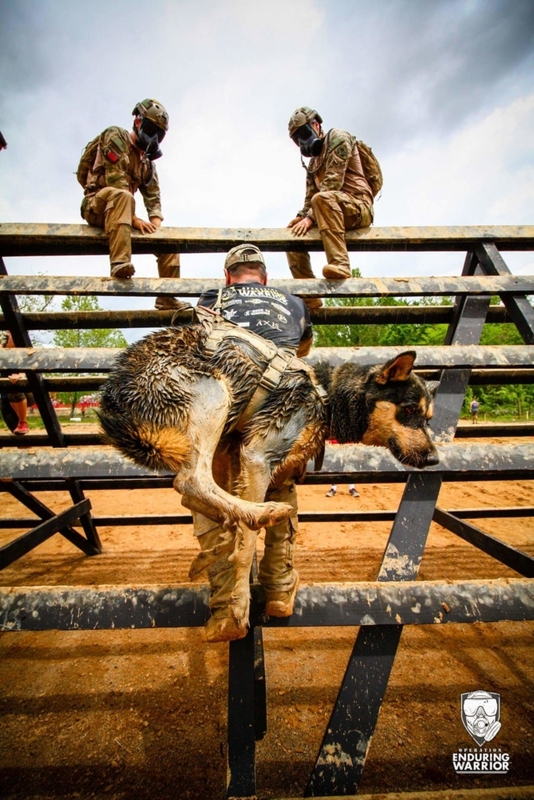 The comradery, the teamwork, overcoming obstacles literal and figurative that is thought would never be achievable again made him feel alive for the first time since his accident. When he crossed the finish line, all he could think of was that he wanted to do another lap. Right before a family trip to New York, he decided to make a stop at Walter Reed to show his kids his last duty station. They collected some items and made thank you cards for the wounded warriors, and he posted on social media asking anyone who wanted to join him to feel welcome. He received a response from a completely random stranger that said “HEY TOUGH GUY, HOW ABOUT A WORKOUT WITH US WHILE YOU ARE HERE?” He didn’t say who or why or when, and Jonathan didn’t need to know details. He was in. He arrived around 7pm to a warehouse and was greeted by SFC Kolberg, wearing a Big Red One patch on his hat – making Johnny feel immediately like he had found a brother. Upon entering, he saw a group of “Badass Veterans”, most sporting the Operation Enduring Warrior emblem. 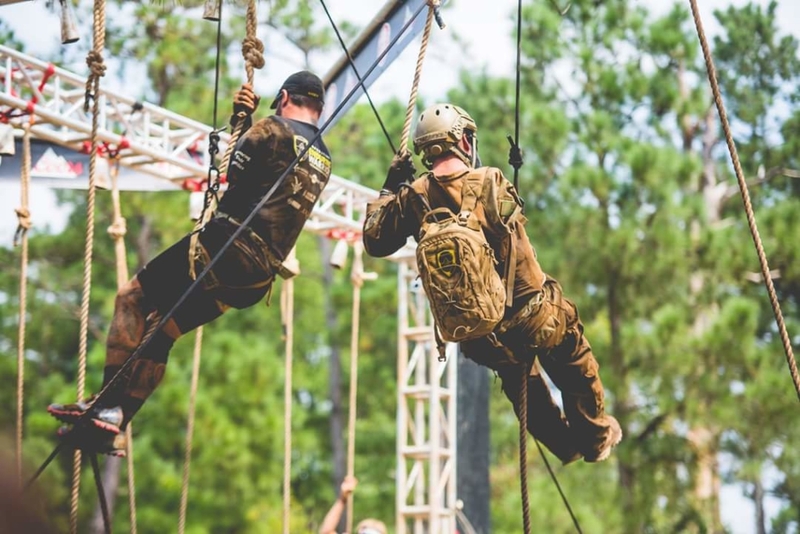 He did not know much about the organization, outside of some pictures online of men and women running OCR’s in full gear with rucks and gas masks, which struck him as both intimidating and motivating. In person, all he felt was welcomed and honored to be there. They engaged in a scheduled 45 minute workout that lasted about 4 hours. He was intrigued, humbled and hooked. 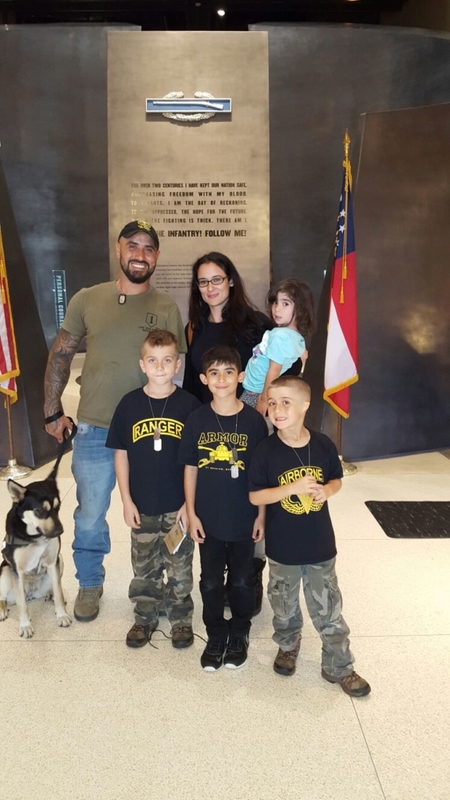 An immediate part of the OEW family, Jonathan began right away, accepting as many invitations as possible, and completing a double trifecta with them next to him, every step of the way. The more he raced, the better he understood the organization and the mission to empower wounded veterans such as himself. He discovered that the direct impact was immeasurable and that the mission is so strong, that it seemed to affect everyone who witnesses the experience, not just those directly involved. During the Spartan Super in Ashville, a volunteer recorded Johnny doing the rope climb and the video went viral. 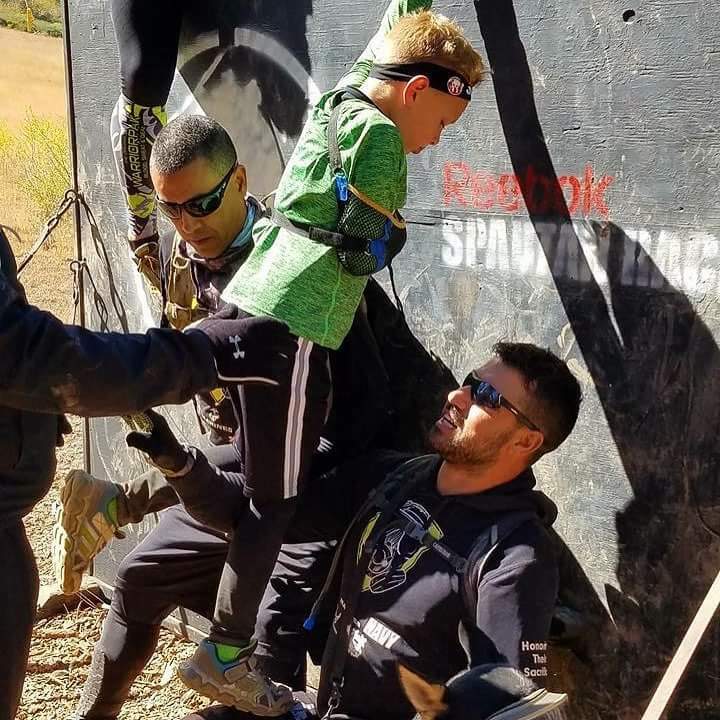 He saw a comment that caught his attention; “I can’t wait for my son to wake up to show him this video.” That comment was left by a woman whose son Ryder had lost function in his right arm at 6 years old and was determined to do an OCR. In a matter of days, Jonathan spearheaded a team with OEW and headed to California to run along with this young man who refused to give up. Then – there is Zoe. These days we cannot talk about one without talking about the other. Her mother was a pregnant rescue and Jonathan adopted her as a 7-week old pup. While only intended originally as a companion, he quickly discovered the emotional and therapeutic benefits of this amazing girl. Her company and her dependency on him helped keep the depression manageable. Her ability to love unconditionally and lack of “pity” made her a perfect companion on his new journey. She is his best friend and always by his side – but unlike your everyday “man’s best friend” Zoe goes the extra mile – or rather quite a few extra miles. She does not just come to the races with him – she completes the whole course with him….obstacles and all. 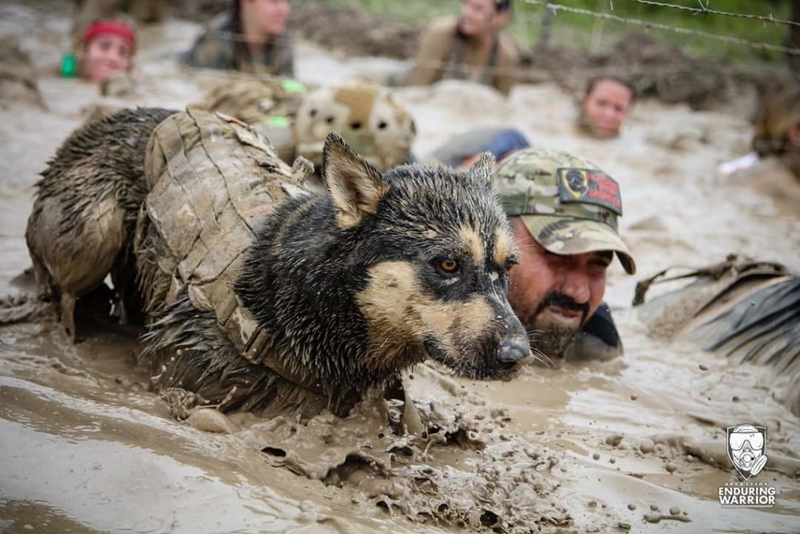 Over the cargo nets strapped to his back, assisted over walls, right through the mud pits, you’ve never seen a happier dog. She loves all the attention she gets on the course, and if anyone is laying down and is thinking of giving up, she just walks over and licks their face. She is pretty impossible to ignore and even more impossible not to fall in love with. She has also made Jonathan aware of the importance of connecting the right animal with the right person, and has become involved in helping to facilitate that connection for several people, and continues to do so. All of this has given Johnny a renewed sense of purpose and the feeling that he is doing something truly meaningful. It has changed everything for him, his family, and everyone who meets him. 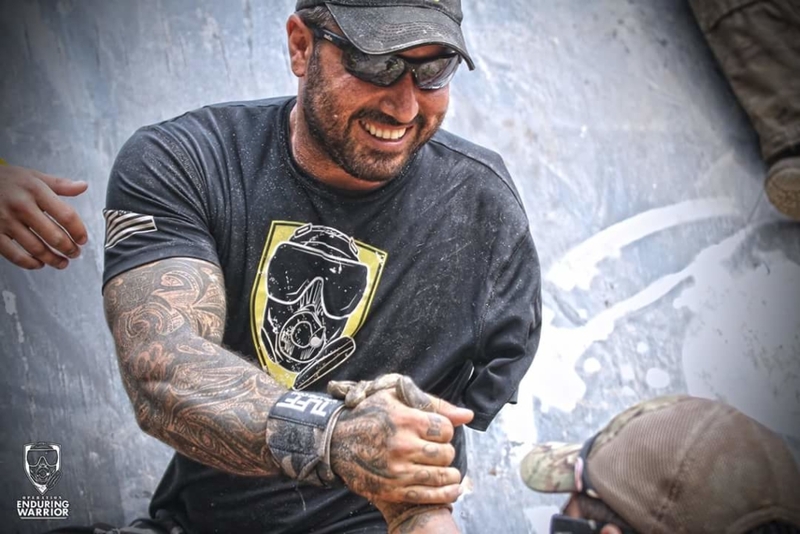 He has embarked on an “unstoppable journey” along with Operation Enduring Warrior to search out and reach as many veterans as possible to deliver a simple message: No matter what you think or what you feel – you are NOT alone. I am sure that he is going to continue to make an enormous impact on the countless people who encounter him.